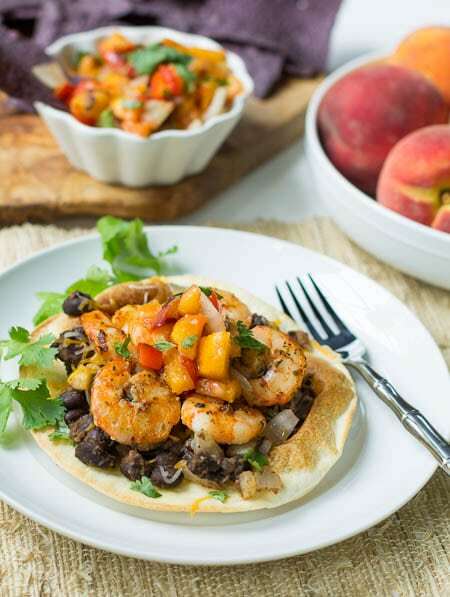 This is a delicious tostada recipe with sautéed shrimp and a sweet and spicy grilled peach salsa. Tostadas are great for a weeknight meal- kids love them, they’re light but full of flavor, and you can combine all kinds of ingredients to make them (ie. great way to clean out the fridge!). 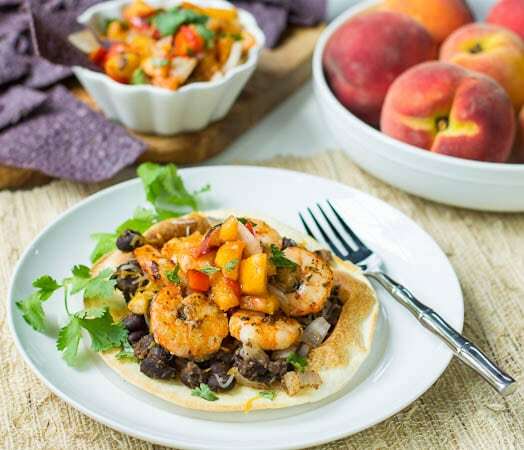 The ingredient list may look long, and it doesn’t include the Peach Salsa recipe (I’ve included a link to that recipe) but most of the ingredients are spices. If you have your spices organized (says the one who spent 10 minutes looking for the oregano :() you can make it in a snap. The shrimp, salsa, and even the beans can easily be made a day in advance. If you wanted to make this recipe super quick and easy, you could always use a jarred salsa. But making fresh salsa is definitely worth the effort. I love black beans, but a can of refried beans could also be subbed. Combine onion powder, garlic powder, paprika, ancho chili powder, thyme, oregano, basil, and salt in a small bowl. Sprinkle shrimp with spice mixture. Heat 2 teaspoons oil in a large nonstick skillet over medium-high heat. Add shrimp and sauté 2-3 minutes until cooked through. Set aside. In a small saucepan, heat 1 teaspoon canola oil and sauté onion for 3 minutes. Add garlic and sauté 1 more minute. Add beans, ancho chili powder, and water. Mash beans with a fork and cook until beans are heated through. Season to taste with salt and pepper. Heat oven to 375º. Spray each side of tortillas liberally with cooking spray. Place on a baking sheet and place in oven for 2-3 minutes. Flip and bake another 2 minutes. Top each tortilla with ¼ cup bean mix and 2 tablespoons of cheese. Place in oven until cheese is melted. Top with shrimp, salsa, and fresh cilantro. 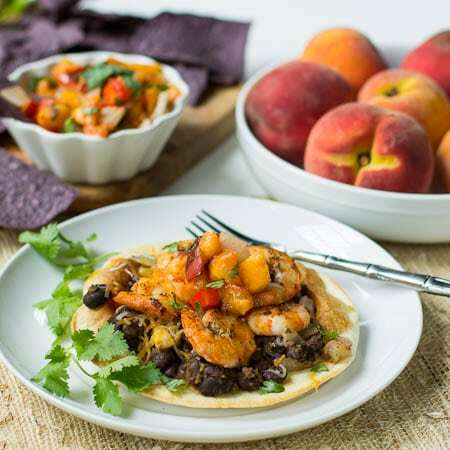 This entry was posted in Main Dishes and tagged peaches, quick and easy meals, salsa, seafood, shrimp, tostadas. Bookmark the permalink.